With great power comes greater egos, and even greater banter! When the headquarters of secret organisation S.H.I.E.L.D are compromised and a mysterious source of unparallelled power is stolen by the villainous Loki (Tom Hiddleston), brother of Thor (Chris Hemsworth), it is time for S.H.I.E.L.D Director Nick Fury (Samuel L. Jackson) to launch the Avengers Initiative; a programme designed to assemble Earth mightiest heroes into one super team in order to save humanity from an otherworldly threat. However, the process of bringing The Avengers team together was never going to be straight forward, with the complex backgrounds, dynamics, egos and alter-egos clashing between superheroes Tony Stark/Iron Man (Robert Downey Jr.), Steve Rogers/Captain America (Chris Evans), Bruce Banner/The Incredible Hulk (Mark Ruffalo), Thor, Natasha Romanoff/Black Widow (Scarlett Johansson) and Clint Barton/Hawkeye (Jeremy Renner) - the real challenge isn't saving the world, it's just getting along! With a huge existing fan base from the comic books and the existing films, there is immediately a lot of pressure riding on bringing together four separate film franchises and combining them to create one mega-franchise - alongside the high potential of very easily screwing it up by attempting to do too much with too many characters (this could have very easily become Iron Man 3). However after years of hard work developing and building up towards this one film (with clever hints and sub-plots added to all of the recent Marvel Studios films), director Joss Whedon proves his worth as the man for the job by creating a superhero film that is as fantastic as it is ambitious; successfully merging four franchises into one. The only flaw that I found in the film was that it does start off a little bit slow as the Avengers assemble, something that is to be expected as it is key to the whole film and therefore excusable. However once it pushes past this, the film very quickly takes off in a huge way; flowing with exhilarating action scenes and fantastic humour blended seamlessly together to create one hell of a fun trip. 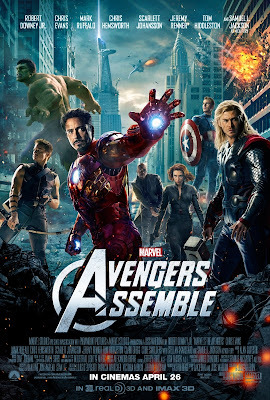 As an action film, I cannot remember seeing a film as genuinely exciting as Avengers Assemble; a film which features a level of cinematic spectacle and scale that is truly hard to match. One shot in particular, taking place during the final battle sequence with one single tracking shot travelling through the city, switching between and following all of the main heroes as they individually do their own thing as part of one epic scale battle, was mind-blowing executed - I'll never know how they managed to write, storyboard or film this impressive single shot! Alongside this the use of humour is enough to match a comedy film in terms of gags and laugh out loud moments (if the film has anything greater than its level of ambition then it's the number of one liners used! ), thanks to the sharp dialogue in Whedon's script and the fantastic acting talents on board too. Ruffalo's Hulk character, arguably the weakest of the four existing franchises, surprisingly steals the show with a number of hilarious slapstick moments that had the whole cinema in hysterics. Bringing together so many large character based franchises means that above and beyond being a superhero/action/comedy film, this needed to be a strong character piece - and it is. Each character is well written, developed and acted; all with their own equally balanced moments in the spotlight. It is this reason why Avengers Assembles works so well, and is far superior to a lot of other blockbuster films of its kind released today. The focus on characters and plot brings us as an audience into the world more, making us become more emotionally attached. This attachment that we develop makes the action scenes that much more exhilarating, the comic moments that much funnier, and the film as a whole that much more enjoyable and rewarding. Unfortunately a lot of blockbusters released today fall at this hurdle; they have the budget, the scope, the stars and the talents needed to make an incredible experience, but cheaply and lazily fail to develop a good enough script or set of character to make us as an audience feel involved or emotionally invested enough - often leaving us seeing something forgettable and unrewarding. In achieving this so skilfully, Avengers Assemble made me leave the cinema feeling fully satisfied in the knowledge that I had seen something spectacular that would last with me for a long time; a special experience that I won't soon forget - and isn't that what the cinema should do? With a lot riding on it, and huge potential to become the biggest disappointment and disaster in the history of film, Avengers Assemble is a well crafted blockbuster that perfectly balances it's fantastic story, plot, action, humour, dialogue, characters, emotion, excitement and spectacle that have leapt out of the minds of Joss Whedon and Marvel Studios and on onto the big screen. In this case bigger is definitely better (if available, IMAX is a highly recommended option); Avengers Assemble breaks the mold to prove that an ambitious and high budget special-effects action blockbuster can provide both spectacle and quality. As one of the most most exciting and funniest films I've seen in a long time, this incredibly fun ride is definitely one to embark upon. 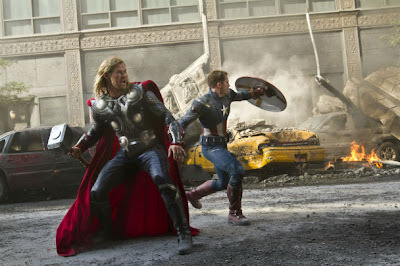 Avengers Assemble is now showing in cinemas across the UK.